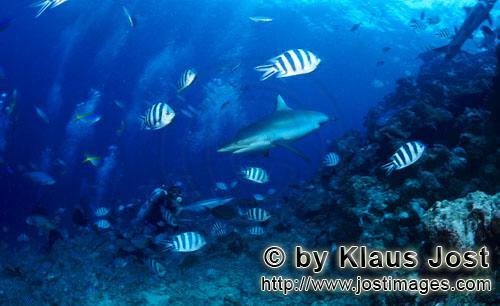 The grey reef shark (Carcharhinus amblyrhynchos) is one of the most common reef sharks in the Indo-Pacific. It is found as far east as Easter Island and as far west as South Africa. This species is most often seen in shallow water near the drop-offs of coral reefs. The grey reef shark has a broad, round snout and large eyes. This species can be distinguished from similar species by the plain or white-tipped first dorsal fin, the dark tips on the other fins, the broad black rear margin on the tail fin. Most individuals are less than 1.9 m (6.2 ft) long. Grey reef sharks are fast-swimming, agile predators that feed primarily on fishes and cephalopods.